I had never been to a Jamboree or a Confido or a Cubboree so I didn’t really know what to expect from a 2 night camp but Wow, Wow and more Wow. The only thing that I can liken it to was that I once went on an “all inclusive package holiday to Tenerife” where all food, drink and activities were included. 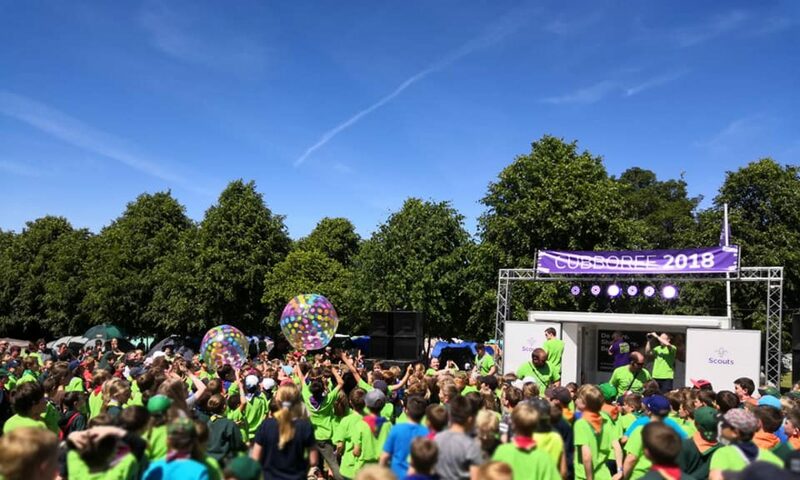 And that’s Cubboree – just like Tenerife, we had sunshine, we had late nights, we had dancing and singing, we had unlimited drinks (tea , coffee and squash), and the best bit we had 50 activities to try. It’s a safe and enclosed area so our Cubs can go wandering and try the activities they want to try, although we encouraged ours to try as many as possible. The activities are as varied as you can imagine, from woggle making to riding to Segways, from mountain biking to plate spinning, from archery to soap making, from laser quest to crawling through a cave bus, and the list goes on and on. Our Cubs reckons they managed 28 of the activities over the 2 days. The organisation is incredible and no wonder this event only happens every 2 years – it must take that to plan it. I haven’t even mentioned the food, where the plus 1000 attendees are catered for at breakfast, lunch, diner and evening snack no matter what you are allergic to, it’s sorted – you will not go home hungry. Just like a week in Tenerife on an all inclusive package you will go home tired, unwashed, in need of a good sleep but you will go home having had the best experience of your life with memories you will never forget. My particular highlights were Cubs showing me they had not changed any clothing for 2 days, a discussion with Cubs having no recollection at all that they had woken me up during the night to show them where the toilets were, a Cub being scared as it was his first time away from home but making it through the first night and absolutely loving rest of weekend, meeting other leaders and realising we are all the same with same challenges and rewards, and finally can’t wait until 2020 World Jamboree in County Durham where we will have over 3000 young people for a week long “all inclusive package”.